25 years of MoS in numbers: What is Sony actually getting for its money? Yesterday, Sony Music Entertainment rocked the dance world with its acquisition of Ministry of Sound Recordings. And while the figure tabled for the label has yet to be disclosed, Music Week analysis of Official Charts Company figures gives some indication of just how valuable an asset the MoS catalogue could be for Sony. Celebrating its 25th anniversary this year, Ministry of Sound has based much of its business around the compilations market. In Q2 2016 the company’s album share was 2.5% (AES), while three of its albums (Throwback - Slowjamz, The Annual 2016 and Go Hard Or Go Home) featured in the Top 10 compilations album chart for the first half of the year. 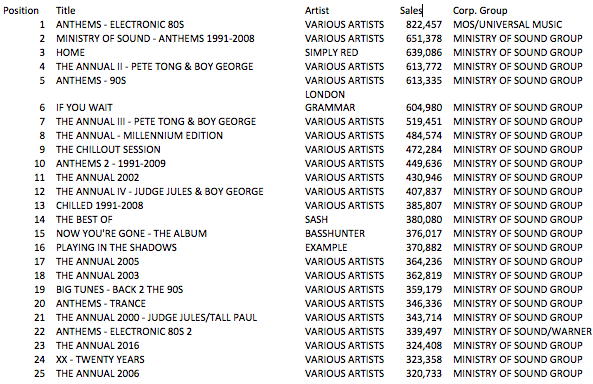 Below, we have charted Ministry of Sound’s Top 25 albums of all time in which it is listed as corporate group, complete with sales figures, to offer some idea of the value the brand will bring to Sony. As one would expect, it’s mostly various artists’ compilations, but there is a smattering of non-comp releases. These include London Grammar’s If You Want, Sash's Best Of, Basshunter's Now You're Gone - The Album and Example's Playing In The Shadows. It’s worth noting that its top selling album Anthems – Electronic 80s and No. 22 in the chart Anthems – Electronic 80s 2 were released jointly with MoS by Universal and Warner respectively. Still, the list is likely to make particularly edifying reading for Ministry’s new owners.